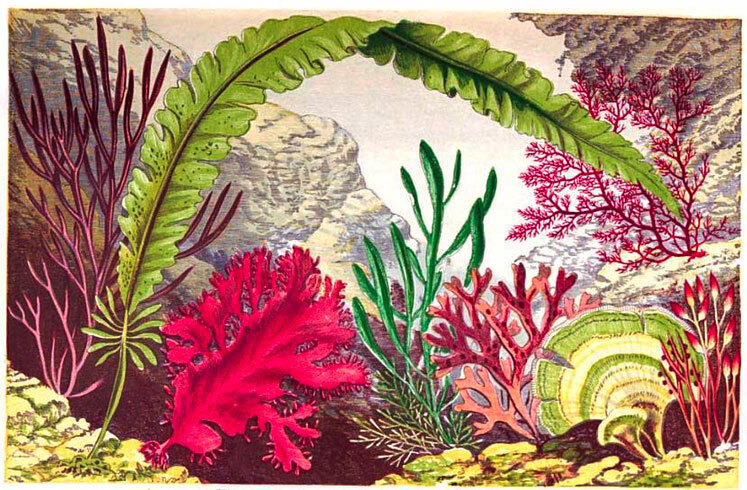 Among quaint fads of the 19th century, like riding bicycles or playing board games, one sticks out like a sore thumb—the Victorian-era obsession with seaweed. That’s right: Affluent Victorians often spent hours painstakingly collecting, drying, and mounting these underwater plants into decorative scrapbooks. Why seaweed? In Western Europe and the Americas, the 18th and 19th centuries were a time of major cultural upheaval, as industrialization reshaped nearly every aspect of daily life. New national holidays and improved labor laws gave working people more time off, which they could spend at home or enjoy by the seashore, often a quick train ride away. At the same time, influential naturalists like John James Audubon and Charles Darwin helped develop a popular interest in science and nature. Birdwatching boomed; taxidermied creatures filled middle-class homes; fur and feathers dominated fashion trends. The shift to wage labor also helped spread the concept of leisure time, when people could explore their personal interests and hobbies. As the Victorian parlor or “withdrawing room” became the locus of private life, the chaotic outside world was ordered and beautified through home furnishings and decorative collections. Finally, improvements in printing technology created an explosion of paper ephemera, like the die-cut imagery explicitly designed for album-making. A generation of scrapbookers was born. 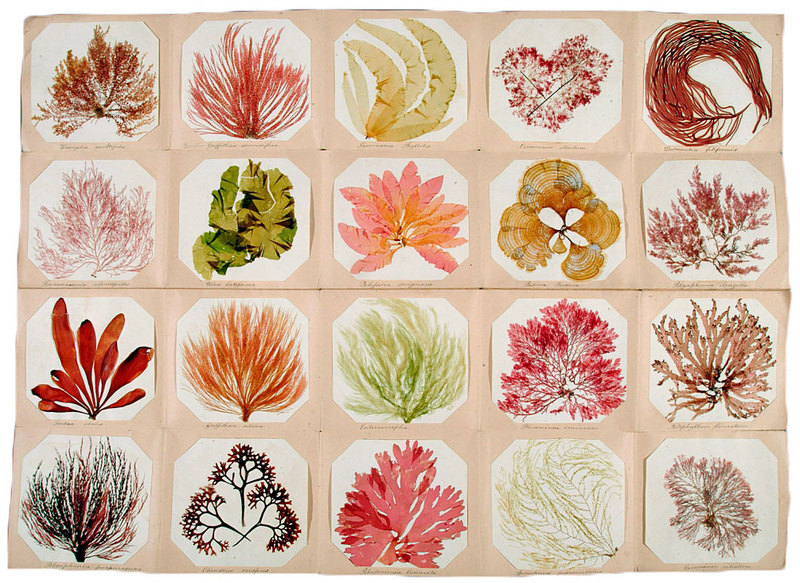 Top: A collection of seaweed from the Jersey area of the United Kingdom, circa 1850s. Courtesy the Natural History Museum, London. Above: Two cyanotype prints from Anna Atkins’ “Photographs of British Algae,” released as a series between 1843 and 1850. 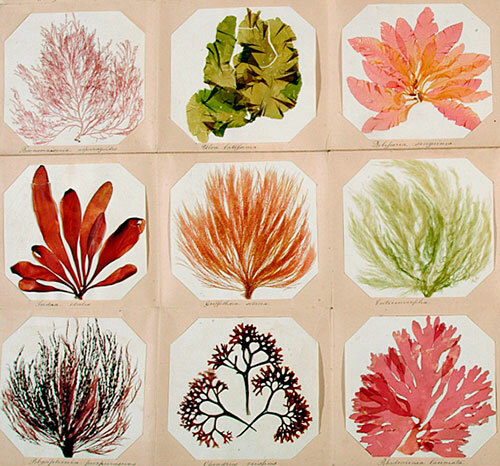 Seaweed collecting embodied a cross-section of Victorian-era pursuits, allowing people to explore nature, improve their scientific knowledge, and create an attractive memento to decorate their homes. 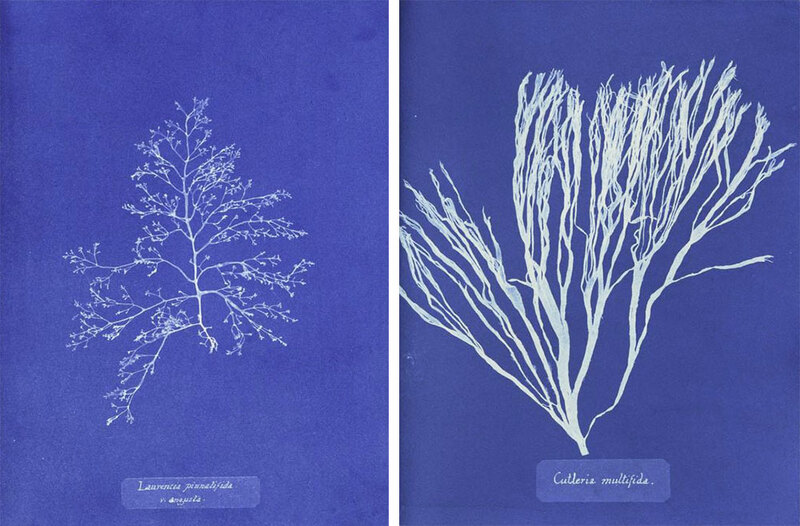 By the 1840s, several books on identifying and preserving seaweed had been published, including the series “Photographs of British Algae,” by Anna Atkins. 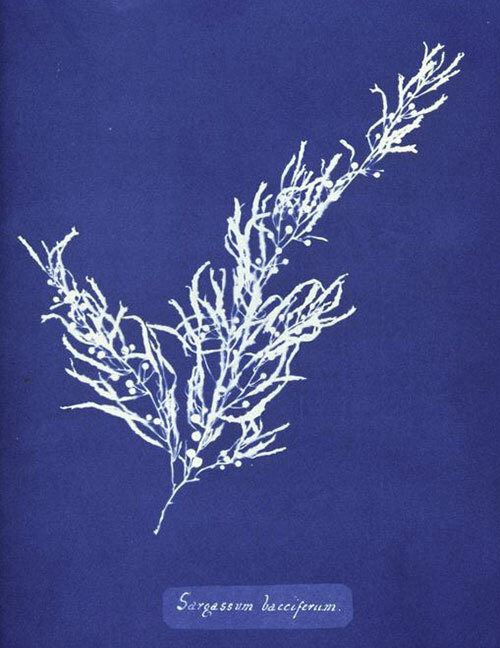 Atkins’ guide is considered the first-ever book of photography, as she used cyanotype prints to document various species (seaweed was placed onto photo-sensitive paper and exposed to light, resulting in a negative image of the plant). 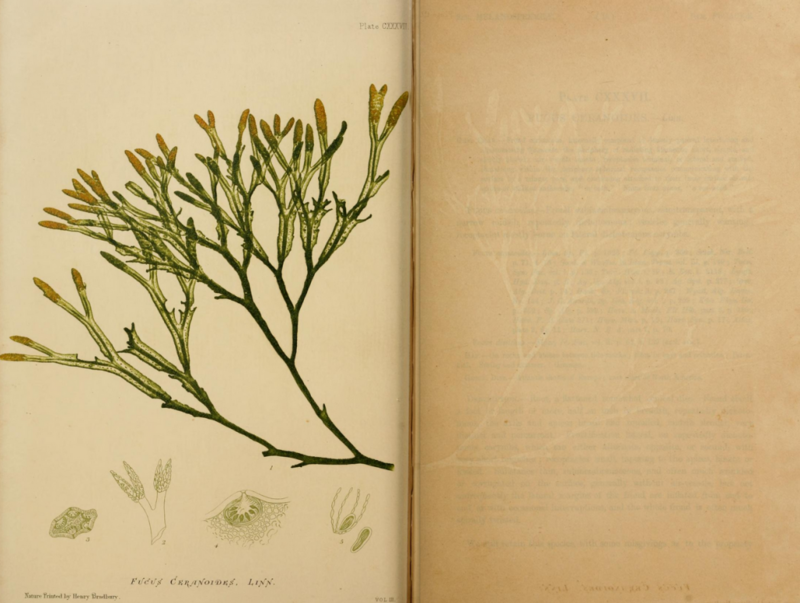 Massey began researching the world of seaweed collecting after her firm acquired a handmade seaweed album marked “Miss Mary Carrington,” though it’s still unclear whether the book was made for or by Ms. Carrington. We recently spoke with Massey about the insatiable curiosity of Victorians and their love of seaweed. Collectors Weekly: How did your firm acquire Mary Carrington’s album? 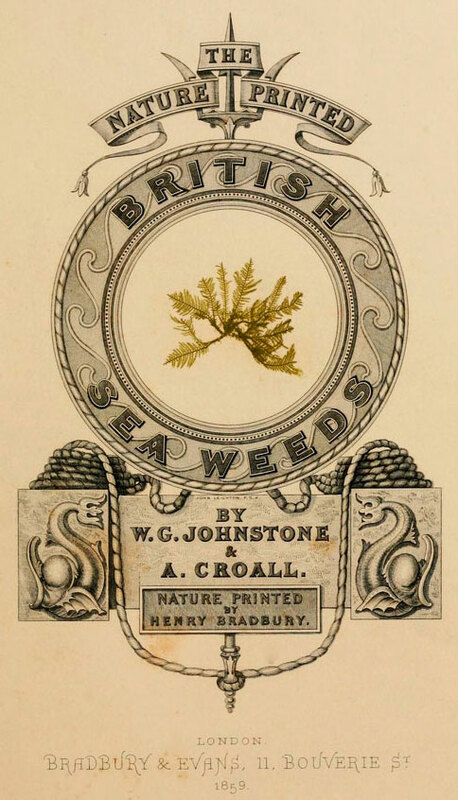 The title page of W.C. Johnstone and A. Croall’s “British Seaweeds” from 1859, which was illustrated with Henry Bradbury’s nature prints. Laura Massey: A colleague and I have a particular interest in women’s history and in craft skills traditionally defined as feminine, and we keep our eyes open for unusual items, such as this album, which we purchased from another bookseller. 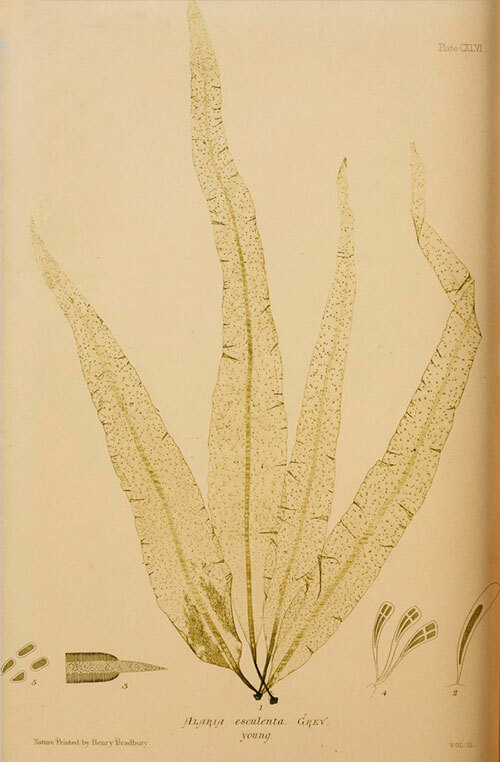 We think that this example came from the northeastern United States, because the blank book in which the seaweed was arranged was published in New Haven, Connecticut. That location makes sense, as seaweed is plentiful along the cold, rocky shores of New England, and the region would have had a large population of middle- and upper-class young ladies with the time and resources to pursue aesthetic and intellectual hobbies. This is the first seaweed album we have handled, and they seem to be among the rarer types of albums we come across. There are several reasons for this. 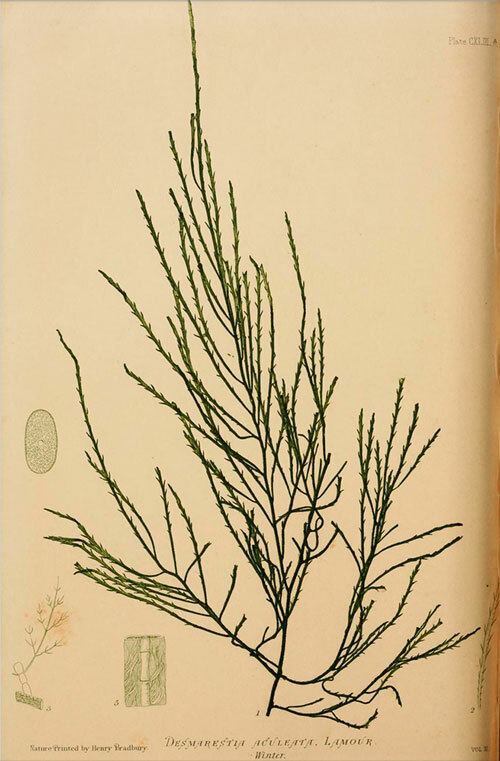 Seaweed collecting wasn’t quite as popular as mainstream hobbies—it was more technically demanding than pressing flowers, and was restricted to regions where seaweed occurred naturally, or to people who could travel to those regions. I also suspect that when families were dealing with estates they might have seen the aesthetic value in an album of fashion prints or flowers, but perhaps not in seaweed, and discarded them more readily. But as with other types of material, these come and go on the market, and you might go a long time between sightings and then stumble across two or three in a short span of time. One of Bradbury’s nature prints featured in Johnstone and Croall’s seaweed guide. 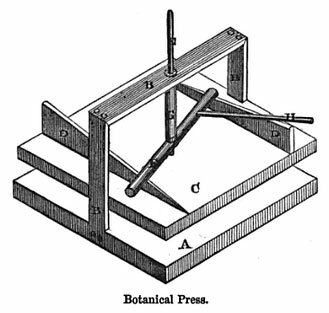 Developed in 1853, the process created an impression of the plant on a lead plate, which was inked and used to make highly realistic prints. Collectors Weekly: How did the broader genre of scrapbooking originate? Massey: I suppose it depends on how far back you want to look. The argument could be made that scrapbooking is an extension of medieval and early modern literary practices such as compiling and the production of commonplace books. Compiling was a literary form during the Middle Ages in which scholars selected material from established authorities, such as the Church fathers and Aristotle, and combined them into new books. Commonplace books were an early modern and Victorian phenomenon in which readers recorded literary passages in their own blank books to save and organize them for future reference. But scrapbooking as we know it today appeared at the beginning of the 19th century. The rise of the middle class created a population of young, educated women who didn’t have to do manual labor and needed edifying activities to fill their time. At the same time, the Industrial Revolution was making paper and books less expensive, and women had access to unprecedented numbers of magazines, newspapers, prints, and fashion plates. Entrepreneurs saw that there was a market for volumes in which to preserve ephemera, and most stationers probably stocked a variety of blank books for use as journals and scrapbooks by both men and women. By the end of the century, publishers were even producing ready-made, color-printed, and die-stamped scraps. And certain shops, such as that of Mary Wyatt in Torquay, England, specialized in natural souvenirs and catered to the needs of collectors for albums and other materials. 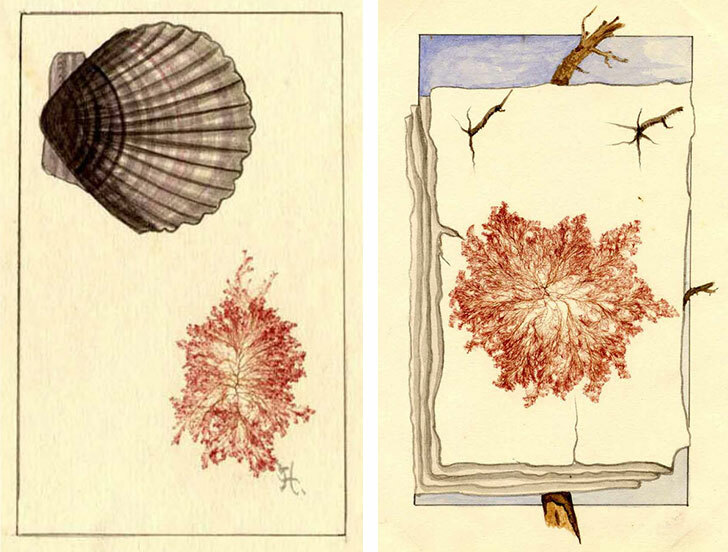 Three pressed seaweed specimens were likely collected near Martha’s Vineyard, Massachusetts, by Mary A. Robinson, circa 1885. 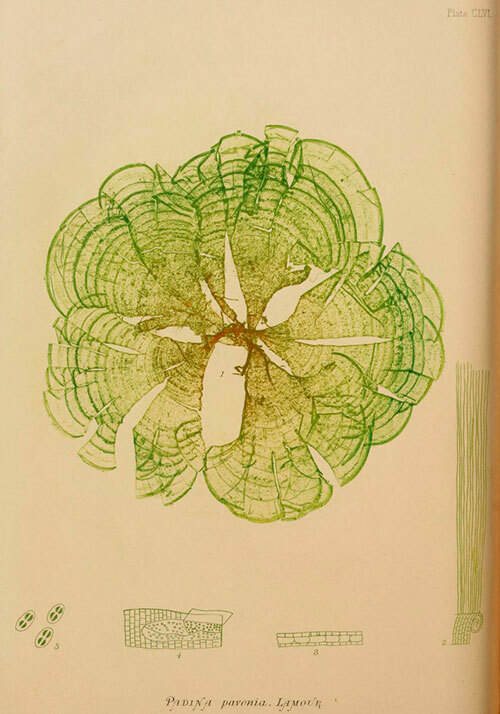 Courtesy the Harvard Botany Libraries. As with other types of books during the period, customers could choose whether to buy an album in the publisher’s boards (basic bindings of stiff, pressed paper boards) and have it rebound to their own taste, or buy a copy that had already been bound by a stationer or bookseller. 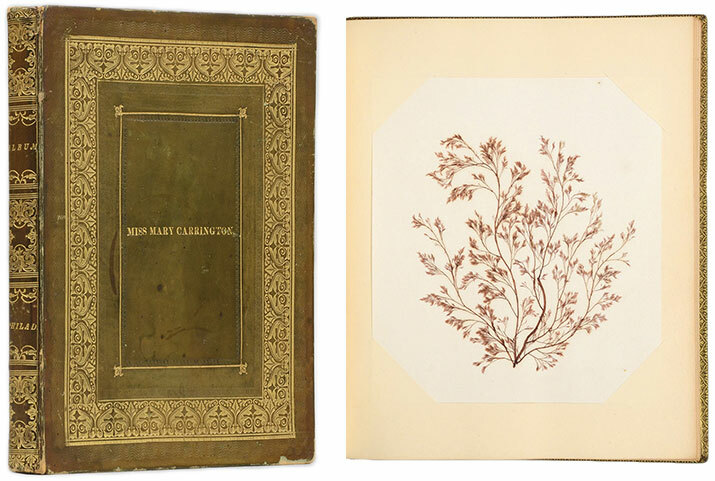 The Mary Carrington album is a mass-produced blank book that has been specially bound, probably by the stationer before he sold it, and the owner would have had her name applied to the cover after the purchase. 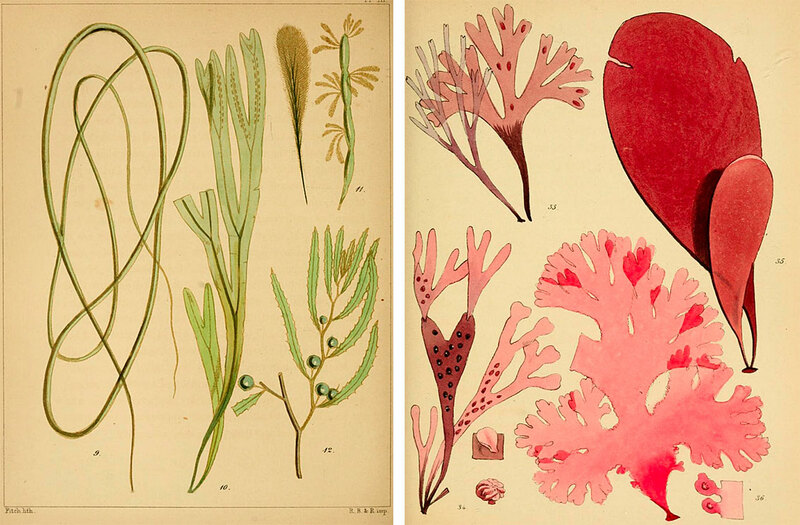 Collectors Weekly: When did seaweed collecting become popular? 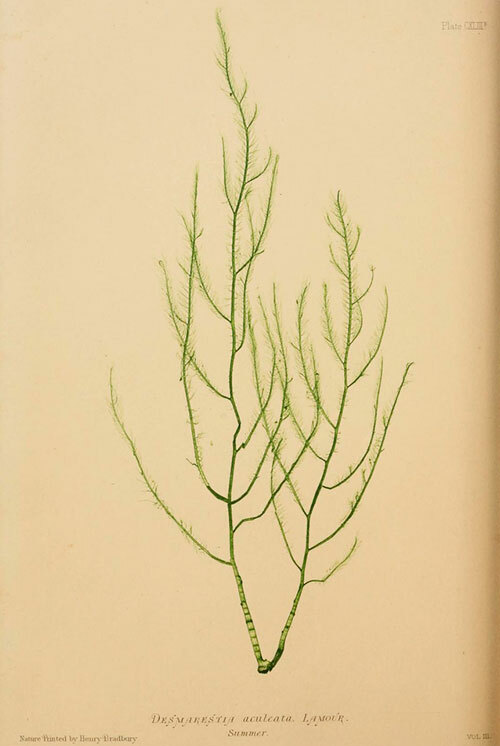 Massey: Seaweed collecting began around the same time as scrapbooking, and seems to have been most popular in Britain, though it was certainly practiced in the U.S., as the Mary Carrington scrapbook attests. Collecting natural-history specimens had already been a prestigious hobby among gentlemen during the 17th and 18th centuries, and this filtered down to the middle classes at the beginning of the 19th century. The Victorians were passionate about collecting and organizing all aspects of the natural world, from local seaweed and mosses to exotic birds. This was connected to the development of science as an organized, professional occupation; to the expansion of empire and trade; to Christian morality, in which the study of nature was viewed as a way to gain a deeper appreciation of God; and to the Romantic movement, which emphasized the beauty and terror of nature. The Victorians found thousands of ways to bring the natural world into the domestic sphere, like with the display of taxidermied animals or the incorporation of animal products and natural motifs into fashion and home furnishings. One of the most interesting ways was through drawing, another hobby for young ladies that was intended to put them in touch with the natural world and the search for the “picturesque.” We recently had two original drawings by Charlotte Brontë, and I wrote a piece explaining how they fit with the Victorian interest in the natural world and the need to provide young women with productive hobbies. 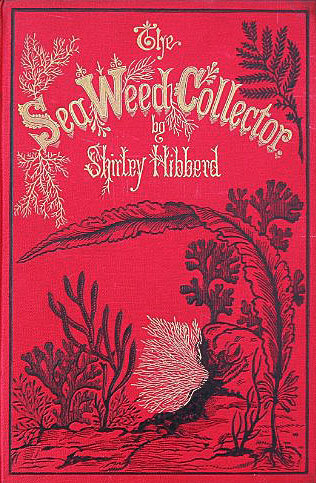 Shirley Hibberd’s “The Sea Weed Collector” from 1872 included vibrant illustrations of exotic underwater environments. Part of the appeal was what a seaweed collection said about the collector. 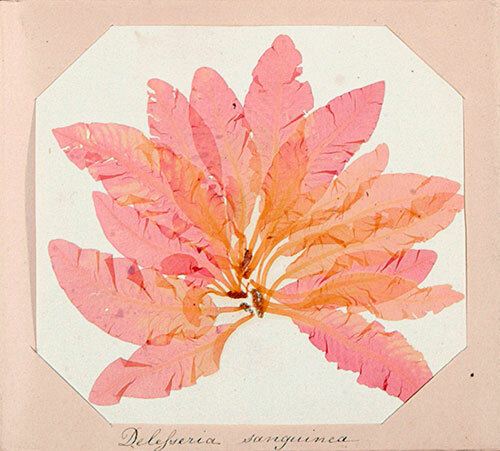 Anyone could appreciate and collect flowers, but painstakingly obtaining, preserving, and mounting seaweed specimens demonstrated patience, artistic talent, and the refined sensibilities necessary to appreciate the more subtle beauties of nature. Queen Victoria herself made a seaweed album as a young lady. I’ve searched all over for Victoria’s album, but have been unable to locate it. Many collectors artfully arranged specimens or embellished them with original drawings, as seen in these plates from Mary A. Robinson’s album. Courtesy the Harvard Botany Libraries. Collectors Weekly: How would someone actually press seaweed for display? Massey: Harvard University’s library website has a good description of the process taken from a late 19th-century guide to the hobby. 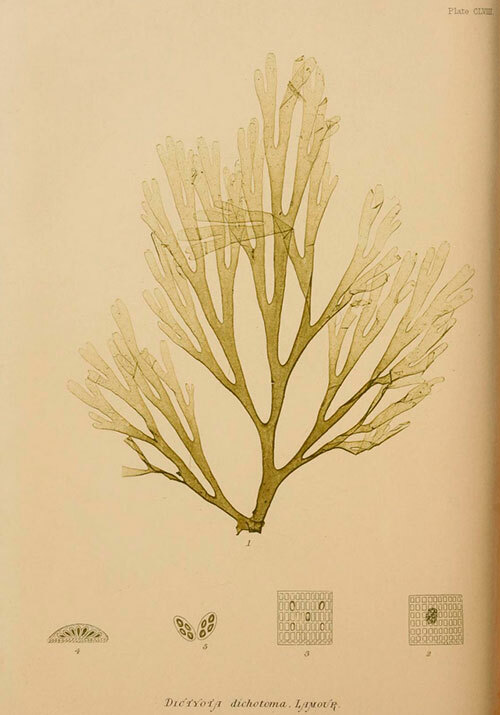 The seaweed was first cleaned in salt water and then placed on the mounting paper, with the collector expected to trim “superfluous” branches and arrange the specimen in an aesthetically pleasing fashion. Next, the mounted specimens were layered between blotting paper and pressed with up to 50 pounds of weight until they dried. Under these conditions, seaweed exudes a gelatinous substance that sticks it directly to the paper without the need for adhesives. We believe that the same process was used for our album, as there is no glue holding the specimens down. Collectors Weekly: What about the smell? Massey: As far as we’re aware, cleaning and pressing the seaweed in this way removed much of the smell. The album we had in stock had no odor, though I can’t say for certain whether this was due to the mounting process or its age. The Victorian era was also a more pungent time, so I suspect they either wouldn’t have been as bothered by the smell or would have used one of their creative methods for minimizing it. 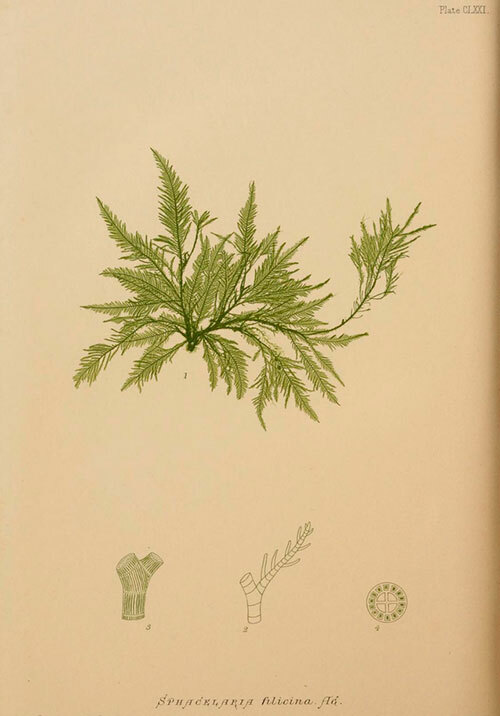 Two identification diagrams from David Landsborough’s “A Popular History of British Seaweeds,” which was first published in 1849. Collectors Weekly: When did seaweed collecting go out of style? Massey: I’m not exactly sure when seaweed collecting went out of fashion, but it was probably in the late 19th century as tastes and fashions changed, and the Victorian mentality gave way to modernism. I haven’t seen any scrapbooks or guide books dating past that time, though of course it was probably still practiced by a small number of people, and there may be hobbyists doing it today. But there certainly wasn’t a decline in scrapbooking in general. You might think that the social changes of the early 20th century, such as the movement of women into the workforce, would have ended scrapbooking’s popularity, but this wasn’t the case at all. In fact, these changes gave women even more reasons to preserve ephemera, and there are wonderful examples of scrapbooks from this period relating to the suffrage movements, detailing women’s experiences during the First and Second World Wars, and recording their working lives. We recently had a great Jazz Age scrapbook that captured the excitement and uncertainty of that period for a young Midwestern woman. Scrapbooking was still a popular hobby up through the last decade, but we’ll have to see what happens as more of our paper ephemera becomes digital. You might say that websites and applications such as Pinterest and Evernote are the digital equivalents of 19th- and 20th-century scrapbooks, but there is something to be said for a beautiful piece of paper ephemera lovingly pasted into a blank book by hand. 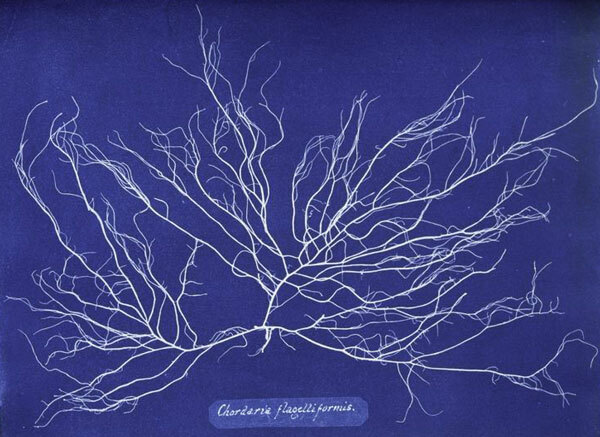 A cyanotype of Chordaria flagelliformis by Anna Atkins, circa 1840s. 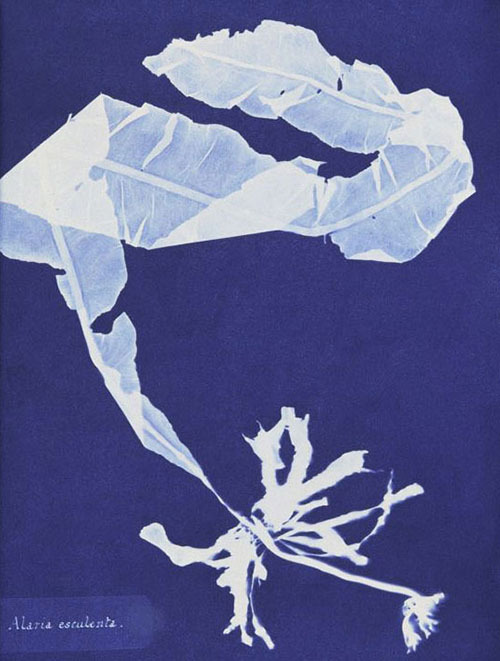 A cyanotype of Rhodomenia ciliata by Anna Atkins, circa 1840s. 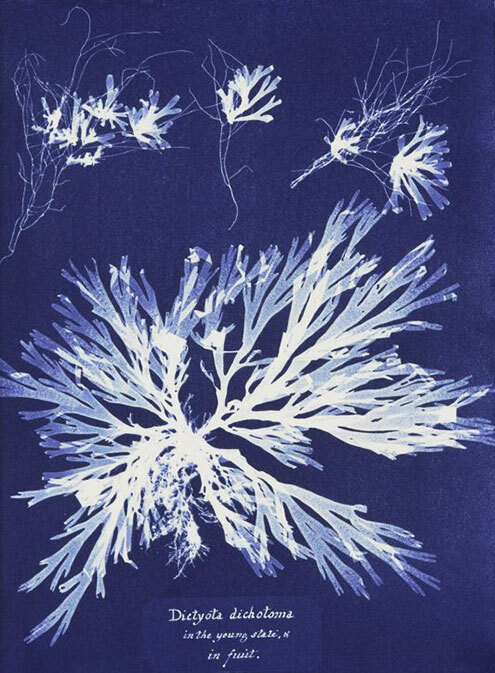 A cyanotype of Fucus machaii by Anna Atkins, circa 1840s. 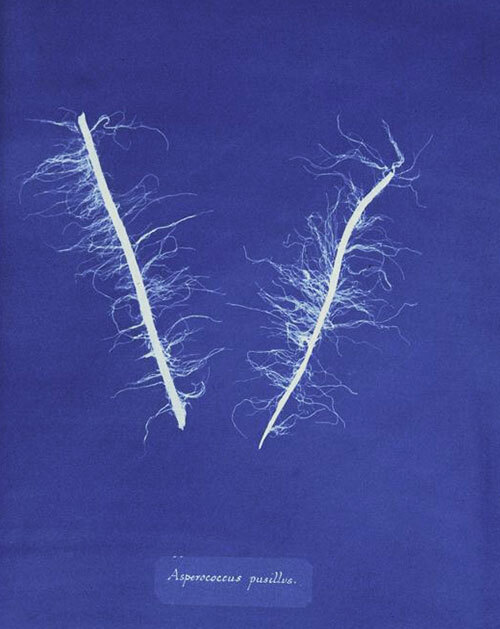 A cyanotype of Alaria esculenta by Anna Atkins, circa 1840s. A cyanotype of Asperococcus pusillus by Anna Atkins, circa 1840s. 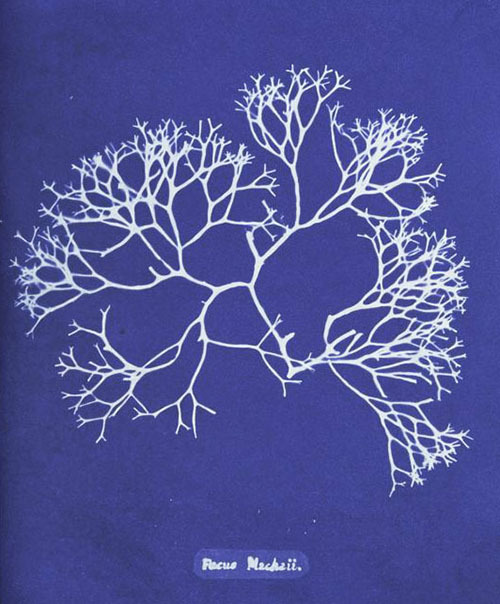 A cyanotype of Dictyota dichotoma by Anna Atkins, circa 1840s. 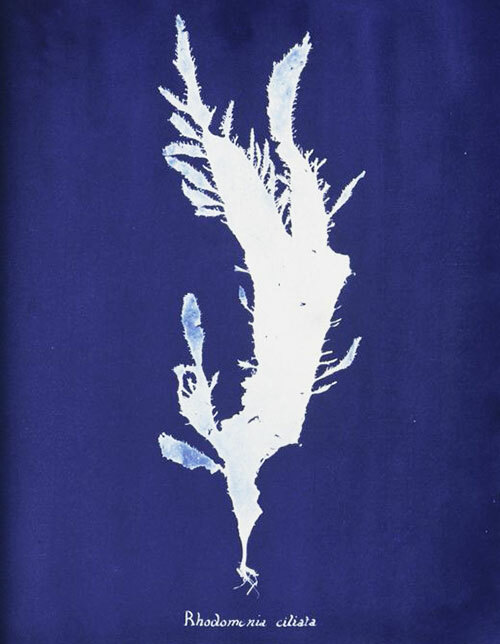 A cyanotype of Sargassum bacciferum by Anna Atkins, circa 1840s. 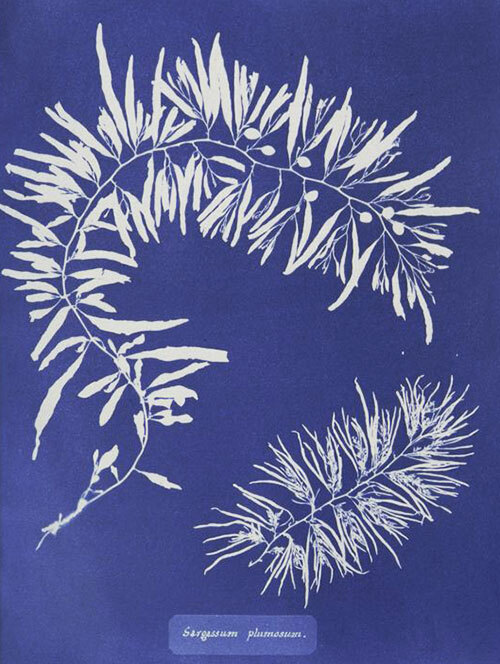 A cyanotype of Sargassum plumosum by Anna Atkins, circa 1840s. 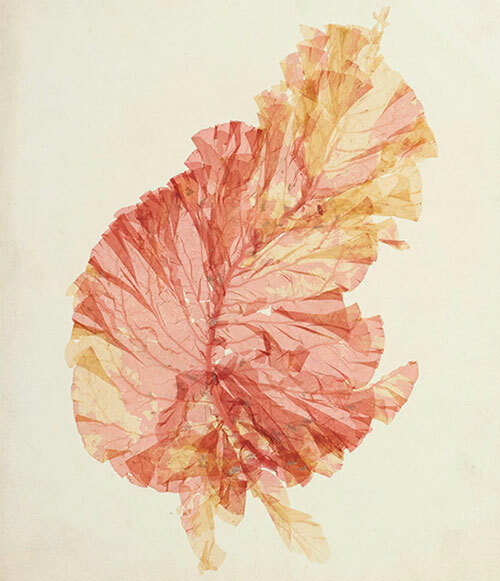 Seaweed collected near Jersey, England, during the 1850s. 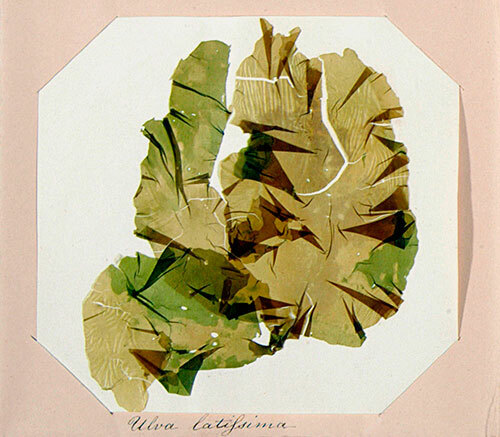 Ulva latissima collected near Jersey, England, during the 1850s. Padina pavonia collected near Jersey, England, during the 1850s. Delesseria sanguinea collected near Jersey, England, during the 1850s. 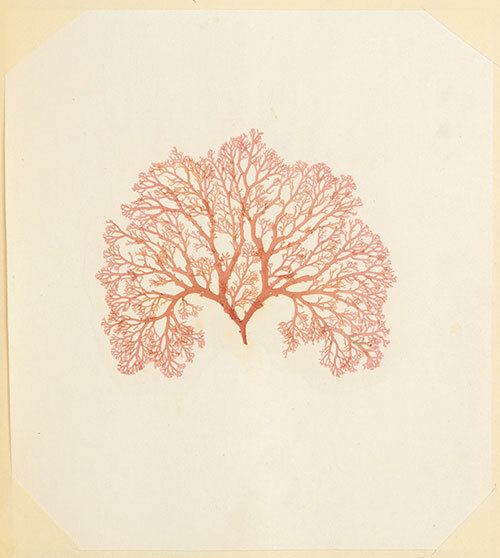 A nature print of Fucus serratus by Henry Bradbury, circa 1859. A nature print of Alaria esculenta by Bradbury, circa 1859. 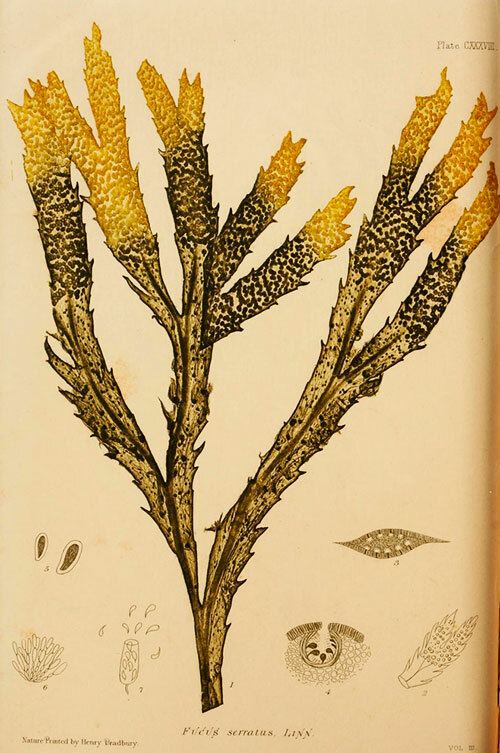 A nature print of Fucus nodosus by Bradbury, circa 1859. 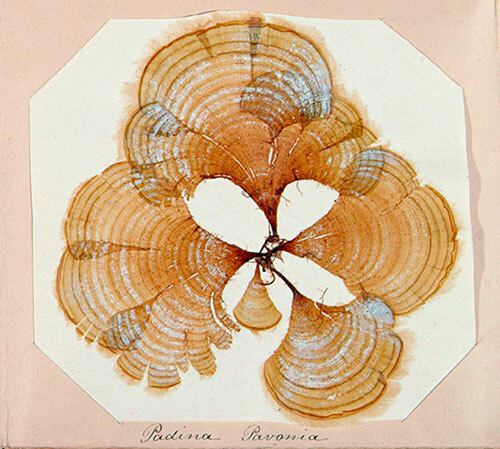 A nature print of Sphacelaria filicina by Bradbury, circa 1859. A nature print of Desmarestia aculeata by Bradbury, circa 1859. A nature print of Padina pavonia by Bradbury, circa 1859. A nature print of Dictyota dichotoma by Bradbury, circa 1859. 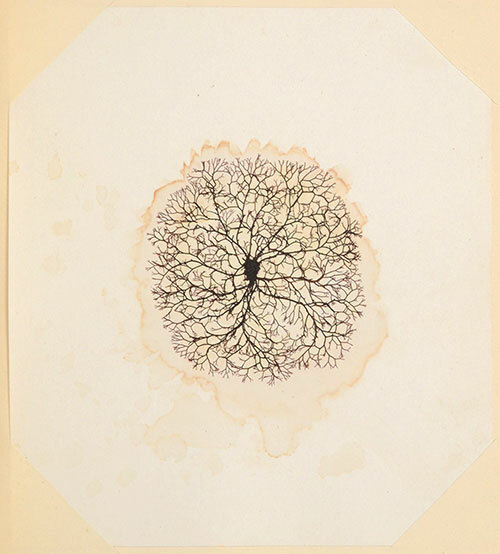 A specimen from Mary Carrington's album, circa 1830. Loved the article on chatelaines worn by Victorian women. These ladies knew how to combine multitasking with a beautiful piece of jewelry. And all we get are cell phones and laptops. Wouldn’t you rather have a Tiffany chatelaine with dangling notebook and pencil? 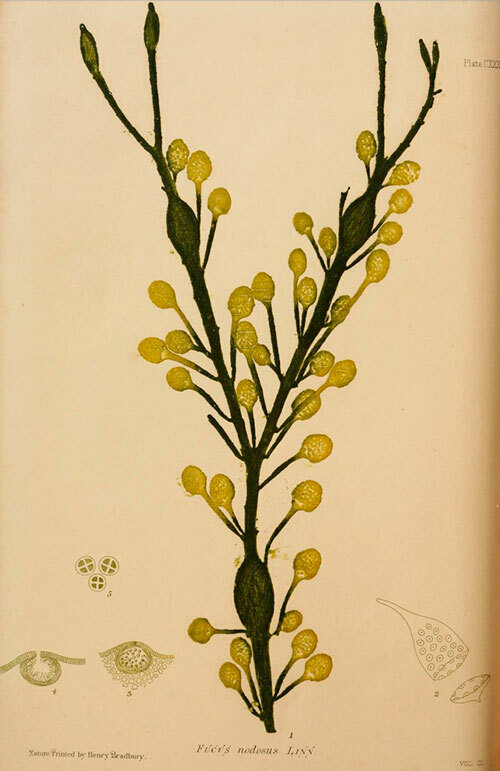 There were many late 19th Century women on the west coast who collected and pressed seaweed specimens and sent them up to William Albert Setchells, head of the botany Department at UC Berkeley, furthering the study of phycology (seaweed) with their knowledge and persistence. The secrets of seaweed reproduction was unraveled by a woman, a gift to the seaweed (nori) industry of Japan. Lots more in my forthcoming book from Abrams: An Ocean Garden: The Secret Life of Seaweed. I write about Anna Atkins in my book Beach: A Book of Treasure; she was the ultimate polymath. I own such a book. Mine is quite beautiful and each piece of seaweed is dated and signed with type and where collected. I was actually interested in selling it. But I don’t want the book to be taken apart. Some of the pieces are shaped into harps or hearts, anchors.